How do you browse the internet? – If you’re anything like me, you engage throughout the day on your smart phone, laptop, tablet or even a big screen HDTV. Almost all electronic devices today offer internet access, and while that can be exciting for the customer, it can be daunting for a web developer. Since we can’t just ignore the fact that we are engaging and accessing the web from multiple devices, we need to determine the best way to optimize our website for every platform. When it comes to inbound marketing, our goal is to reach as many qualified prospects as possible through remarkable and valuable content. So how can we be sure that our content is reaching all of our prospects and customers, regardless of how they are accessing our information? In today’s post we are going to delve into the importance of responsive design, and how it will get you more quality leads for your business. According to Hubspot, 17.4% of web traffic comes from mobile devices, which is a 6% increase since 2012. For our own site, it's more than double that percentage. Just think about how many people you may be turning away by not having a website that is optimized for their device. In today's day and age, it's important that we all keep up with the times, but even more so, that we are providing our customers and prospects the best experience that we can. And if you don't have a mobile-ready website, well then it’s time to upgrade. And that’s where responsive design comes into play. 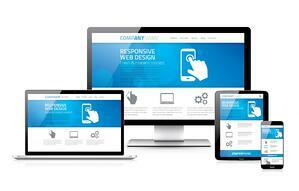 It’s simple, responsive design allows your website layout to adjust based on the type of device it’s being viewed on. The content stays the same, but it adjusts how it appears on screen, providing a seamless navigation for whatever device your visitor may be using. And the best part is that with responsive design you only have to update and maintain one website. We use the HubSpot COS which leverages the Twitter Bootstrap framework, which breaks your website down into a 12 column grid and adjusts the page layout based on different screen sizes. When it’s viewed on a laptop, for example, the content is spread out, maybe your photo is on the top left and the copy is in a column to the right. When this same site is viewed on a mobile device the website will change, so the photo is centered on the top and the copy is centered below. It’s easier for the mobile viewer because they are only scrolling down and not pinching the screen, zooming in and out trying to read your article. Avoid Flash, QuickTime or any plug-ins that might not be available on mobile devices. Make sure the site's primary navigation, whether it is a drop down menu or toolbar, is large. How Does This Relate to Leads? When someone lands on your website and has a difficult time finding the information they're looking for, there is a good chance they will leave. This is considered a bounce, and the likelihood they'll be coming back is slim. At this point you've lost them, so that's a lead right out the window. Responsive design is tailored to your visitor's experience and designed to turn that quality traffic that you've generated into a real lead. If you have a seamless navigation and are optimized for various devices, you'll have a much better chance of capturing those visitors and converting them into leads. Since your website is usually the first impression you make on a potential customer, it's important that impression to be a good one. Why is that? Because people make decisions emotionally first, then rationalize that decision second. We want people to fall in love with us when they first land on our because these people are our potential leads. Another interesting point, is that website that utilize responsive design rank higher in search engines, specifically Google, then those that don’t. This is especially true with mobile searchers. If you “Google” something on your phone the first sites that pop up should all be mobile optimized (go ahead, try it!). These will let you see your site on different platforms from your own computer screen. Hubspot is a great testimonial for this. Since applying responsive design techniques to their website in May 2013 they have experienced a 66% increase in inbound leads, and has continued to show a 34% increase on average for pre-responsive months. Mobile traffic has also increased from 11% to 15%, which means more people are looking at their site on mobile devices and more people are sharing their content from a mobile-to-mobile platform. If you’re still aren’t sold on the importance of responsive design consider this – your potential prospects are accessing your website from more than just their laptop, but they are looking at what you have to offer from their mobile devices and smart tables. To increase your conversion rates and to start gaining quality leads, you’ll need to be sure you have clear conversion paths and a seamless navigation.